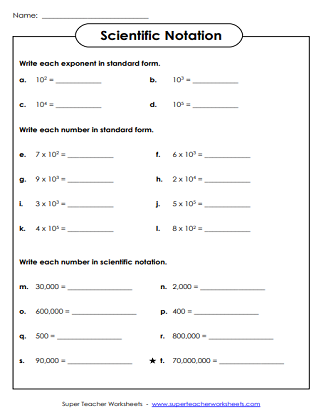 The worksheets on this page can be used to teach or review scientific notation. Students convert the given numbers to and from scientific notation. This worksheet does not require students to use decimals. Answer the math questions. Find sums, products, and differences. Most answers are be written in scientific notation. Convert the given numbers to and from scientific notation. 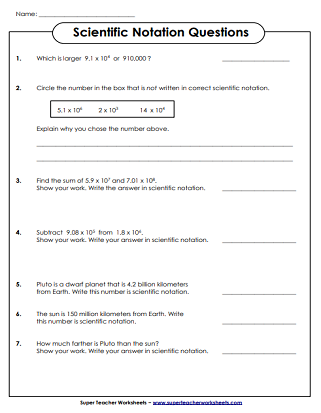 This worksheet requires students to use decimals in their scientific notation numbers. Answer the questions. Students will compare numbers in scientific notation. They will also solve addition and subtraction problems, and write their answers in scientific notation. Students convert numbers to an from scientific notation. This level includes negative exponents and decimal numbers. Answer the questions by converting numbers to and from scientific notation. 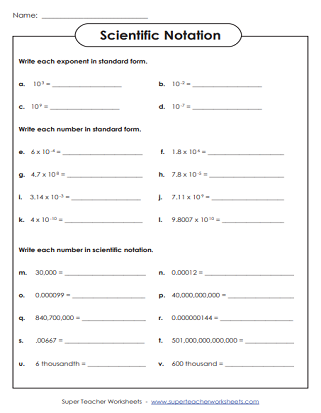 These worksheets can be used for teaching students about exponents, which is a prerequisite for teaching scientific notation. Practice finding the reciprocals of fractions and mixed numbers. Super Teacher Worksheets has thousands of math worksheets, covering topics in the elementary curriculum.